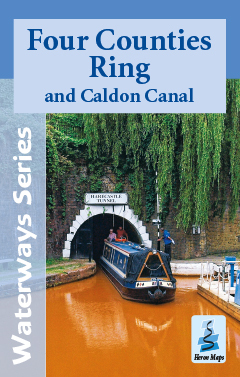 A full colour map of the Four Counties Ring and Caldon Canal suitable for both waterways and leisure users. This map gives detailed coverage of the Four Counties Ring and Caldon Canal including the Shropshire Union Canal from Beeston to Autherley Junction, parts of the Staffordshire and Worcestershire Canal, and Trent and Mersey Canal, and the Middlewich Branch, with emphasis on the waterways and information useful and relevant to users of the waterways without neglecting other leisure users. The map detail is complimented by information panels and photographs. The Four Counties Ring passes largely through rural and open countryside, a few market towns and the heart of the Potteries. It is made up of parts of the Shropshire Union, the Trent & Mersey and the Staffordshire & Worcestershire Canals. From the edge of Wolverhampton at Autherley Junction, the Shropshire Union heads north through deep cuttings, high embankments and a charmingly rural landscape enjoying many lock free miles. Just north of Nantwich the route heads east from Barbridge Junction along the Middlewich Branch towards Middlewich, maintaining its rural feel. On arriving in Middlewich the route passes through Wardle Lock and along the 154 ft (47 m) Wardle Canal, the shortest in the UK, before joining the Trent & Mersey Canal. Turning south the route heads past Sandbach and ascends 'Heartbreak Hill', a series of 26 locks, offering panoramic views across the Cheshire Plain, before at Kidsgrove passing through the Harecastle Tunnel, 5th longest in the UK, emerging to the urban landscape of Stoke-on-Trent. Home to the UK's pottery industry, several world famous names including Wedgwood, Royal Doulton, Spode and Emma Bridgewater offer visitor experiences and retail outlets. The route continues south to Great Haywood Junction, before heading westwards, along the meandering Staffordshire & Worcestershire Canal, skirting the southern edge of Stafford, climbing towards Penkridge and then Gailey, at the end of the summit pound, before a lock free section back to Autherley Junction. It is possible to complete this 110 mile ring in a week, but ideally more time should be allowed to enjoy its charms, such as a detour along the picturesque Caldon Canal at Stoke, through the Churnet Valley towards the Peak District. This tourist map is at 1:50000 with detailed town plans of Brewood, Market Drayton, Audlem, Nantwich, Middlewich, Kidsgrove, Etruria and Hanley, Stone and Penkridge at 1:12500. The Four Counties Ring map is available to buy online or by telephone from our business partner, Guidepost. Click on the logo below to visit their store.